Apply 1 or 2 drops of gel to cover the whole mouth ulcer or lesion. Avoid direct contact of the applicator with the lesion. Do not touch the lesion with the tongue for at least 2 minutes to allow the protective film to form. Use 3-4 times a day, or as needed and avoid eating for at least 1 hour after application. 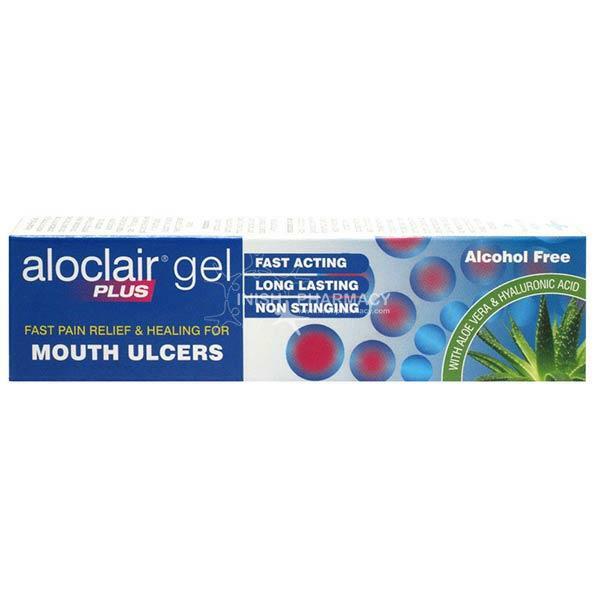 Aloclair Plus Gel promotes healing and helps in the management of pain caused by small lesions in the mouth such as those due to aphthous stomatitis, aphthous ulcers and those caused by braces and ill-fitting dentures. It is also indicated for diffuse aphthous ulcers. Aloclair Plus Gel works by forming a protective film which adheres on the oral cavity to create a mechanical barrier to the affected area, thus relieving the pain caused by exposed nerve endings. Aloclair Plus Gel contains Polyvinylpyrrolidone and Sodium Hyaluronate to help gently and quickly soothe away the pain, and hyaluronic acid and aloe vera to support the natural healing process. Aloclair Plus Gel is a handy pocket sized tube, making it ideal for when you are out and about. As with the rest of the range, no fingers are needed, reducing the risk of contamination.